When it comes to improving your visibility on Google, most great SEO agencies look to improve this via back-linking. With great content, back-linking can serve to improve the visibility of the targeted website, but finding the right opportunities is essential. This is because the old method of spamming links doesn’t work. In fact, it will quickly invoke a negative penalty from Google. Links, much like content, needs to be relevant and have value. As such, you need to know how to find the best sites. Fortunately, there are a number of great tools out there to help accomplish this! Ahrefs is a rather diverse tool, so it is capable of doing quite a lot. One of the things it can do is show you your competitors referring domains. You can then use this information to find websites that are related to your niche – after all, if they’re linking to similar websites, there must be a reasonable amount of overlap – that you have not linked from yet. As the name suggests, Link Research Tools is all about finding and analysing link possibilities. Although it can be expensive, the tools at your disposal can help you find links in numerous ways. You can even find compare numerous websites at once, to see which sites share which linking domains. Similar to Ahrefs, this is a great way to find platforms that appreciate the content you can create. This tool is ideal for finding long lasting links. By searching URLs and keywords, SpyFu’s program finds the domains that have long, existing links. This is particularly useful for ongoing campaigns, where you want content that will remain active, rather than being quickly deleted or buried. BuzzSumo is designed to track shared content, so you can see what’s trending. Of course, this also means you can readily find platforms that discuss topics that you have an interest in. This is a good way of offering content you already have, to help illustrate their existing content. Yet BuzzSumo’s real strength lies in showing what is trending. When you’re trying to find link opportunities, this tool can help show what’s being discussed right now, allowing you to develop content that’s relevant and eye-catching. Finally, if you’re feeling a little experimental, you can always share content via social media. When you have something great, like an appealing infographic or map, getting this out there is often enough. If people want it, it will appear on various sites. Not only will this (hopefully) generate some natural links, it will show you which websites are interested in your platform… and have already been exposed to your content. This makes introducing yourself much easier! 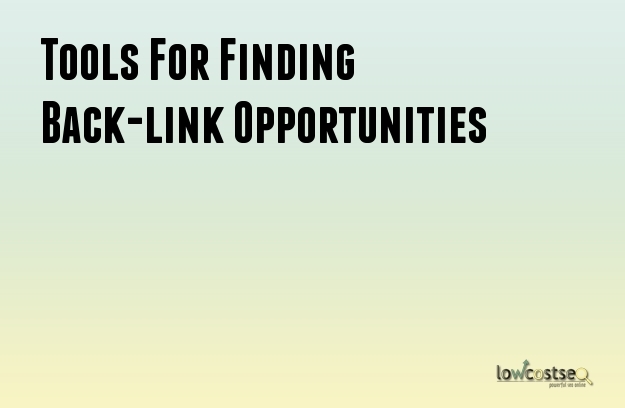 So, there you have it – 5 great tools to help you find the best back-linking opportunities. These methods will help ensure the links you create are relevant. Not only does this please Google, it ensures readers have an active interest and reason to click through to your website in the first place.